NASA’s Cassini spacecraft spotted a big reflective feature near the north pole of Saturn’s huge moon Titan in June 2016, a new study reports. Cassini discovered numerous lakes and seas of liquid hydrocarbons on Titan’s frigid surface during the probe’s pioneering 13 years in the Saturn system. But this newfound bright patch — which covered 43,330 square miles (120,000 square kilometers), about half the combined surface area of the Great Lakes here on Earth — isn’t one of them. “It’s like looking at a sunlit wet sidewalk,” lead author Rajani Dhingra, a doctoral student in physics at the University of Idaho in Moscow, said in a statement. The likely rainfall event signals that summer weather had arrived in Titan’s northern hemisphere by mid-2016, the researchers said. That’s a little later than climate models had predicted. Saturn and its many moons take 29.5 Earth years to complete one lap around the sun, so seasons in the ringed-planet system each last nearly 7.5 years. Cassini arrived at Saturn in mid-2004, during the southern summer, and saw clouds and rainfall in Titan’s southern hemisphere. Titan is the only world beyond Earth known to have stable bodies of liquid on its surface. But this moon’s weather system is very different than that of Earth’s: The rain, rivers and seas of Titan are all composed of liquid hydrocarbons. Cassini studied Saturn, its rings and many moons until September 2017, when the low-on-fuel spacecraft plunged intentionally into the planet’s thick atmosphere. Mission team members ordered the death dive to ensure that Cassini never contaminated Titan and fellow moon Enceladus with microbes from Earth. Scientists think both of these satellites may be capable of supporting life as we know it. 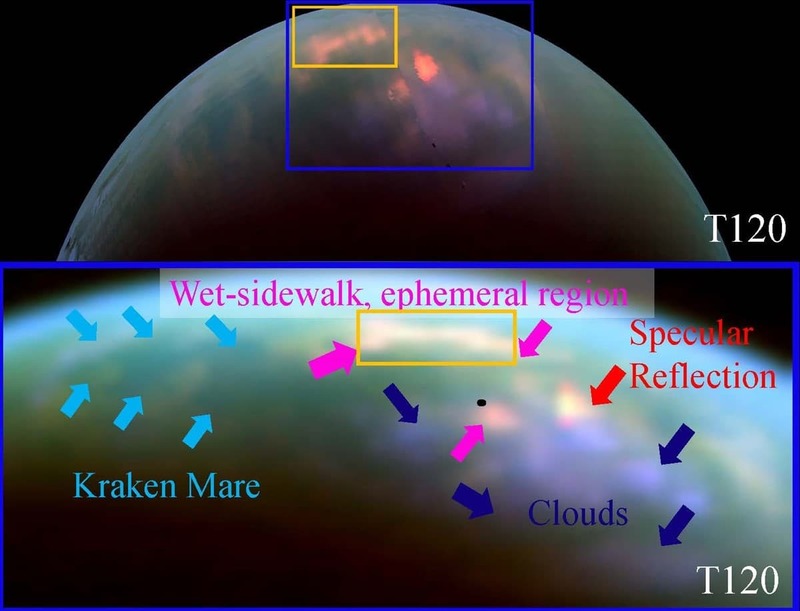 Cassini captured the rainfall-glint image with its Visual and Infrared Mapping Spectrometer instrument, which was able to peer through Titan’s thick, obscuring atmospheric haze.